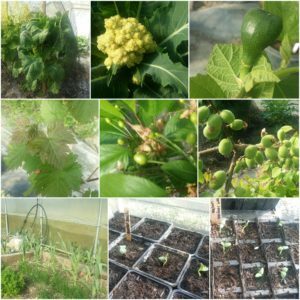 I’ve spent all day today busy in the polytunnel and garden as ever juggling growing and propagating space, I always grow too many plants. In the polytunnel I adopt a policy of polyculture and try to keep all the beds filled throughout the growing season. I grew a lot of plants in pots in the polytunnel when we first started because the soil is very hard to work. It’s a fairly heavy clay so we’ve got a long term project to improve it. At the end of each growing season I add the remains of the straw bale garden, and from this year the hot beds, to the soil. Most plants do quite well in the soil beds even without improvement because for all its faults the heavy clay soil does contain a lot of nutrients, but it is a nightmare to dig and as the Summer progresses gets so hard it’s like trying to work concrete. We’ve got several direct planting beds that have been improved enough to work on now though and that’s where I was planting this morning. 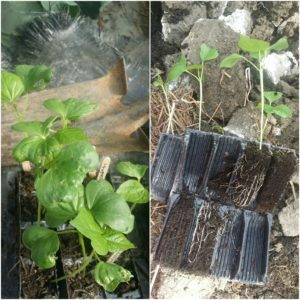 First for planting were my cotton plants. This is part of the slow textile project I blogged about recently The cotton project . I put the cotton in my heated propagator because they need a temperature of 25 C to germinate. 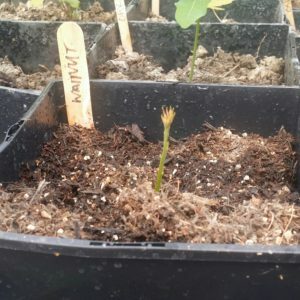 I achieved a 90% germination rate which I was pleased with. Here are some of my cotton plants ready for planting. As you can see I use root trainers for my seedling. It means I can fit a lot of plants in a small area, move them around easily and use less compost. I’ve planted all the cotton in one bed. I might add some other crops as under planting depending on how quickly the cotton grows. I haven’t done much research into pests. I’m hoping that there won’t be too many as it’s not a native plant though I’m sure slugs will have a nibble if they can. 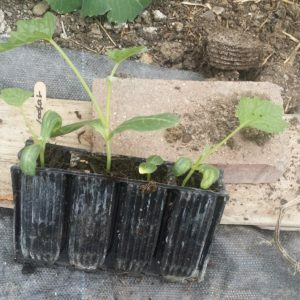 After the cotton I decided to plant out another of my experimental crops Luffa or Loofah squash. This is the plant that Loofah sponges come from. The squash are dried and then you get a loofah sponge. I’m hoping that I get enough sponges to add them to the Christmas hampers I make with homemade soaps for family and friends. Next on the planting list were Watermelons and Melons in the beds that currently have Elephant garlic in. We’ve started harvesting the Elephant garlic so there will gradually be more room for the Watermelons and Melons. Last year I only had three melons but they were delicious so I’ve planted 10 plants this year. I’ve planted the same number of Watermelon plants but this will be m first attempt at growing Watermelon. From what I’ve read success for both hinges on a long enough, warm enough growing period together with plenty of watering. Hopefully I’ll be able to achieve that in the polytunnel. Finally I was very pleased to see the first of my Walnuts has germinated. Here it is. 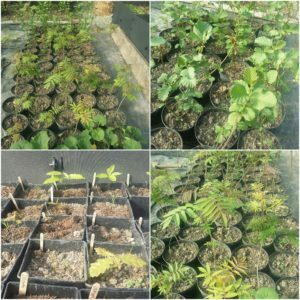 I wrote recently about our Mini Tree Nursery Project The Sweet Chestnut, Oak and Silver Birch that I planted in recent months have all germinated well and the Alder and Staghorn Sumac I planted last year have survived the winter. Our plan is to add more trees to Hooters Hall over many years. I want to grow lots of trees from seeds and also then take cuttings. We’re mainly growing trees that we can use for fuel, use for projects on the smallholding e.g. fencing and natural dyes. We’re going to fence off an area at the back of the polytunnel, cover it in weed suppressant fabric and use this for bringing on our tree seedlings until we’re ready to plant them out. I might also dedicate part of it to a small coppicing area. Smallholding activities have been somewhat curtailed over the past fortnight after I fell off my horse Bob and broke my clavicle. With my dominant right arm out of action for 6 weeks I’ve not been able to get started on the sheep shearing but fortunately did get the angora goats sheared before I had the accident. I am able to hold a hosepipe and with some assistance plant seeds so I have been able to keep the polytunnel on track. It’s looking like we’ll have another big crop of apricots and cherries this year. I think we might have some plums too which we didn’t get last year. The figs are developing nicely too and will hopefully have enough time to ripen this year. This is our 4th year of growing figs and we’ve had a bigger and better crop each year so far. The perennial vegetables continue to do well and we’re harvesting regularly from the nine star broccoli and the tree cabbage. The grape vines have sprung back into life. We did get some grapes last year but not more than a few bunches. I’ve been told that we should expect a bigger harvest from the third year. This is our second year so I’m just hoping for more than last year. I planted some melon and watermelon seeds last week and they are already starting to germinate. 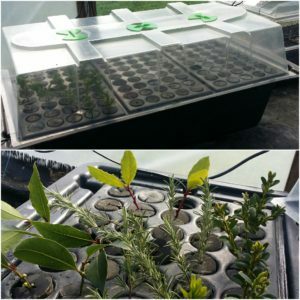 I’ve started them off in the heated propagator so that they have a decent growing period, which will hopefully mean more chance of a successful harvest. Last year my melons did quite well and were delicious so I want more of them. I also planted some Butterbush squash which are also starting to germinate. Butterbush is a variety of butternut squash bred to be smaller and more bush like with smaller squash. Much as I enjoyed our massive squash harvest last year it did mean we dined on squash a lot even though I gave a lot away so I’m hoping we’ll have a more sensible amount of squash this year and more sensible sizes. 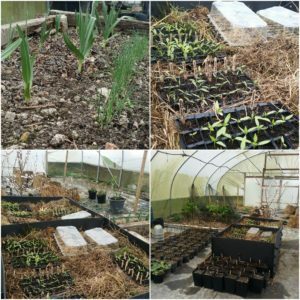 Here’s some pictures from around the polytunnel as you can see the elephant garlic, spring onions and carrots are doing well in the raised beds. I’ll be planting some of my tomatoes in there soon as well. My other growing project for 2017 is to start our own little tree nursery. Our longer term plans for Hooters Hall involve increasing the number of trees we have and particularly increasing the number of trees that we can make use of. 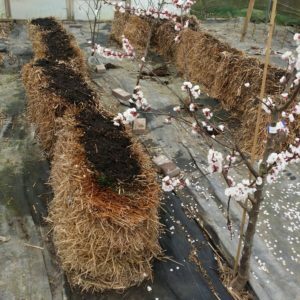 This is a very long term project so I decided rather than buying in bare root trees I’m going to grow them from seed, which also works out a lot cheaper and is very interesting. As my seed grown trees mature I’ll also take cuttings. So far I’ve got some Staghorn Sumac mainly for the use of the leaves in natural dyeing, Alder for dyeing and also firewood, Sweet Chestnut, Oak, Silver Birch and Walnut. Germination rates have been quite good and for now my tree seedlings are in the polytunnel. Our plan for the longer term is to create an outside nursery area for the trees. We’re going to fence in the area behind the polytunnel, put down weed suppressant fabric and gradually move our seed grown trees there. It will be accessed from the back doors of the polytunnel so it’ll be easy to move things around. The weather was a bit changeable this weekend so I was happy having lots of tasks to keep me busy in the polytunnel. Although the polytunnel took quite a battering from storm Doris recently, and we will have to replace the cover, it’s still functioning. First task for the day was to get my Vitopod cuttings propagator up and running. I’ve found that using the Vitopod significantly increases my success rate, particularly with softwood cuttings. It’s a hydroponic cuttings propagator and I think the hydroponics make it very easy to maintain adequate hydration of the cuttings while they are growing new roots. Today I took some Bay, Rosemary, Sage and Box cuttings. I also want to take try taking some cuttings from my fig trees later in the season as well as more herbs. I’ve found that taking cuttings from plants that are already thriving in the environment at Hooters Hall generally leads to more success when it comes to planting out. The polytunnel is full of seedlings at the moment. I’m shuffling them between the heated propagator, the hot beds and my potting table. The hot beds have been working really well. The temperature does drop a bit more than the heated propagator when it’s a cold day but overall they are keeping a temperature of around 20C. Once I’ve got all my seedlings growing well I’ll be using the hot beds to plant out my sweet peppers and in June I’ve got some sweet potato slips arriving which will also go in the hot bed. If there’s room I want to get at least some of my melon plants in their too although they did quite well just in the raised bed lat year. Here’s some pics from around the polytunnel as you can see the Elephant Garlic in the raised bed is coming along nicely I’ve also got quite a few shallots and spring onions. I’ve grown quite a few different varieties of tomato this year. The one that I’m most fascinated by at the moment is Tiny Tim. It’s been bred to be a true windowsill tomato and I’m planning on growing it on a shelf in our South facing conservatory. 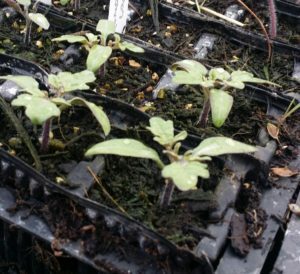 The plants are perfectly formed and thriving but miniature in comparison with the other tomatoes. Here’s a picture. As well as miniature windowsill tomatoes I’ve also got some miniature Blueberries which seem to be doing quite well and I’m going to be growing Butterbush a variety of Butternut squash that is more bush like than vine like and which produces smaller squashes. I’m interested to see the produce from these mini varieties. So far the tomato plants are vigorous but tiny and I’m hoping we’ll have a good crop. Last year I tried straw bale gardening for the first time with great success. I grew cabbage, kohl rabi, beans, peas and spring onions in my straw bales and also planted the same varieties in the polytunnel beds so I could compare them. Without fail the plants in the straw bales were 3 weeks or so ahead of the plants in the beds. You need to keep on top of the watering with straw bale gardening but that wasn’t a problem because we have a water supply in the polytunnel. My straw bales survived the winter and although I wouldn’t want to move them around they seem to be intact enough for another season of growing. I’ve decided to grow salad crops, shallots, spring onions and maybe some carrots in them this year. To get the bales ready for planting I’ve spent the week watering them and adding some fertilizer to get the decomposition going again. Last year I started my vegetables in trays then planted them in the bales as plug plants. This year I’m more confident so I’m starting the seeds straight on the bales. Today I added a thin layer of compost to four of the bales and then sowed some rocket, spring onions and shallots. Here’s a picture. My final job of the day was to plant several trays of sunflowers. I have some that have been bred as cut flowers, an edible variety and a super tall variety that I’ll be taking into my workplace for a sunflower growing competition. I’m looking forward to trying the edible variety . The buds, petals and seeds are all edible. According to the sales pitch the petals can be added to a salad for a colour contrast and a mild nutty taste. The green buds can be blanched, then tossed in garlic butter; being similar in flavour to a Jerusalem artichoke and the kernels inside the seeds can be eaten raw or toasted as a snack.